I wasn't fond of this salad. Took it to a Christmas potluck. Maybe just too many other wonderful food items but this one wasn't a hit and I'll never make this version again. I like this recipe with less sugar. and one of the things I like to add is a can of chick peas, and I always use purple onions. 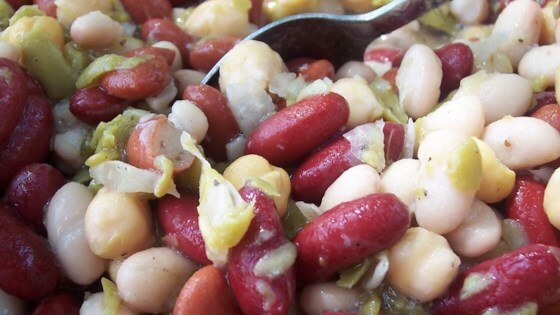 A good basic bean salad recipe, but way too heavy on the sugar for my taste. I cut the sugar by a 1/4 cup and it was still a bit too sweet. This salad is one of my families favorites!! I use red wine vinegar instead of reg. It's better the longer you wait to eat it, if you can wait!! This is a great recipe for three bean salad! Per the recommendation of other reviewers I reduced the amount of sugar, but next time I will use the full amount. I like the salad on the sweet side. This three bean sald is delicious and very easy to make. I added some fresh green beans, steamed for a few minutes to the recipe, making it a four bean salad.